How often an elephant mates depends on the gender. Male, or bull, elephants must enter into a condition called musth before breeding. A female elephant who is not pregnant or caring for a calf goes through an annual estrus cycle. The average birth rate is 21 percent annually, or approximately one live birth for a female elephant every five years, according to the Elephant Research and Education Center website. Adult bull elephants go through musth annually, the only period when he mates. Depending on the elephant, he remains in this state for several days or several months. The musth glands, located on the sides of the face, produce a liquid. At the same time, the male's testosterone levels substantially increase. The bull not only goes in search of a receptive female, but he also becomes more aggressive with other males. He makes a low noise that a female can hear from a distance and respond to in turn. 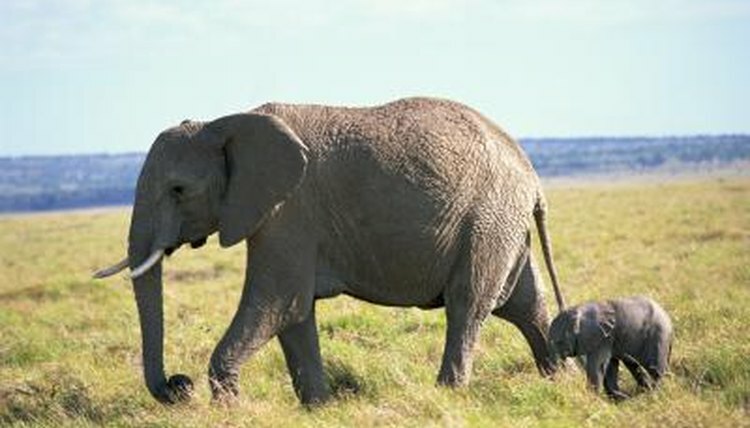 Female elephants, or cows, start breeding and producing calves at approximately age 10. When a female elephant becomes receptive to mating, she demonstrates an "estrous walk." In addition to making a lot of noise, she holds her head high and constantly looks back over her shoulder. Even if a bull elephant in musth can't see her, he can hear her vocalization from a considerable distance and will come looking for her. Before mating, a bull can tell whether a cow is reproductively receptive by smelling her urine. He can smell the hormones in her urine, picking up that vital information via his trunk. The Jacobson's organ, located in his upper palate, detects estrous hormones. If the urine smells right for reproduction, the bull curls his trunk up, a reaction known as a flehmen response. While the female estrus cycle lasts approximately three weeks each year, she's only able to conceive for a period ranging from three to five days. Elephants copulate many times over a few days. The bull stays with the cow for several days after breeding, mainly to ensure that no other bulls mate with her. If the cow becomes pregnant, she'll give birth approximately two years later. She joins a female herd to give birth, which she does standing up. The calf nurses for at least two years but might stay with his mother for years after learning to eat on his own. After the calf is weaned, the mother will mate again, but her calf might live with her until he reaches his teens.